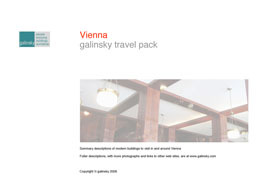 Galinsky travel packs are condensed versions of the galinsky building pages for a particular area, collected together in an easily printable pdf format with accompanying map, for use when traveling. 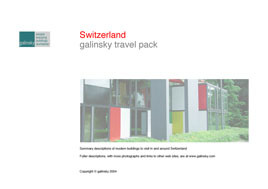 Currently we offer travel packs for Paris, New York, Switzerland, Japan, London and Vienna. 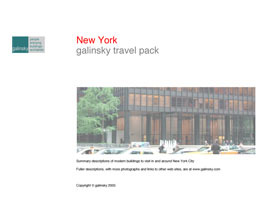 To download a travel pack, right-click on the miniature image and choose "save target as...". 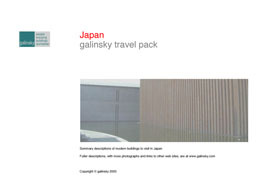 More than 3,000 galinsky travel packs are downloaded every month. Please join in, help yourself, and enjoy your travels. 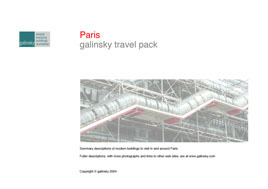 To view or print these travel packs you will need Adobe Acrobat reader. This is free software that is probably pre-loaded on your computer by the manufacturer, but if not you can download it free yourself direct from Adobe. 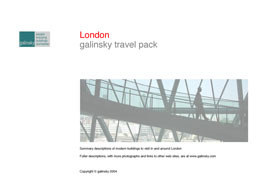 Because these packs contain images of many buildings at once, the files are inevitably larger than a normal galinsky page (around 1MB), but should take only a few seconds to download on a broadband or office connection.